It might be easy to say that one piece of climbing gear is more important than another one and you should spend most of your gear budget on this or that, but in truth, every single piece of your climbing gear is vital. It is this gear, no matter how small it might be that will save your life in the event of a fall and careful consideration must be put into each and every purchase you make – from a quick-draw sling to big ticket gear like your rope. There is one piece of gear above everything else that needs to have a good balance of safety, reliability and comfort – your climbing harness. At Extreme Sports X, we have our favorites – The Petzl Sama, The Arcteryx R300, The Black Diamond Momentum and the Mammut Lotus. But which one of these would we recommend to you above the others? Let’s find out. We tested these harnesses on a few different areas. First, we looked at comfort. The last thing you want is a harness that is uncomfortable after wearing it for a 5 pitch climb that might take you 8 hours. We looked at safety too – in the event of a fall, will it be effective and what shortcomings can it potentially have? Style came into it too – there’s nothing wrong with having an attractive and well-designed harness. Lastly we looked at price. We’d all love to have the best and most expensive kit but in reality, price is a factor. When we combine all of these factors, which one came out top? At around $70 US, the Petzl Sama is at the mid-range point for price in our test. It’s not the cheapest harness on the market but it certainly makes up for it in adaptability. 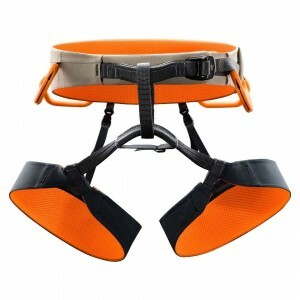 Available in a choice of two different colors, orange and sandstone, the Petzl Sama has been designed for versatility. The medium size harness weighs 390g which is nice and light for those who are looking to minimize the weight of their gear. It’s well ventilated too which means no sweating underneath it – especially important if you’re inclined to climb without a shirt. 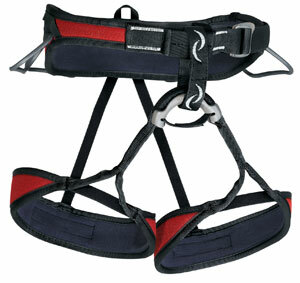 The Sama is a fantastic harness that works well as an all-round piece of gear. For the price you’re getting a harness that you really can use wherever you’re climbing – indoors at a gym or out on the crags no matter how many pitches in the climb. We found little wrong safety wise either. All the buckles and stitching were solid with no give even at high strain. The most expensive harness in our test, the Arcteryx R320 is truly the Rolls Royce of harnesses. It’s dashingly good looking in orange with all the gear loops and belts very carefully laid out to make it look very neat and tidy. The waist belt and leg loops are thin and you can easily sometimes forget you are wearing it. The buckles are self-locking too, which means getting in and out of it is a breeze. Safety and reliability wise, the harness features a technology Arcteryx call Warp Strength Technology which is designed to evenly distribute weight and strain across the full surface of the waist strap and leg loops in the event of a fall. It weighs a shade over 300 grams so it’s very light and compact. While it isn’t the absolute most comfortable harness we tested, it definitely does feel worth the price, which slides in at around $130 US. We all like a good bargain and the Black Diamond Momentum AL is just that. It costs less than $50 US, and that’s a great price in anyone’s books considering what it has to offer. 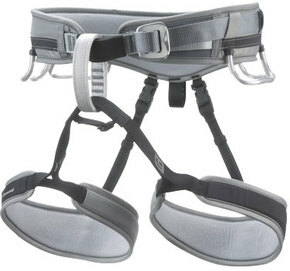 It’s isn’t the best looking harness around – it is plain grey – but don’t let that fool you. Underneath the bland exterior lies a very capable and featured harness. 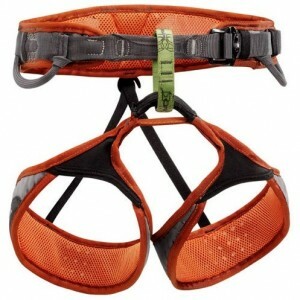 Black Diamond has tried to make the harness as one-size-fits-all as possible and almost everything about it is adjustable. Unfortunately most of these buckles are the double-back type which means it can take longer than necessary to get in and out of it. Overall though, don’t let this put you off because you’re getting a great, comfortable harness that can rival many more expensive ones. The gear loops are plastic coated and the haul strap can accommodate anything you want – even a big chalk bag fits nicely onto it. Whenever I write about Mammut products I try my best not to be biased because I am a firm believer that they make some of the best products on the market. The Lotus is no exception. It sells for around $60 US. For your money you get a dual-purpose 360 gram climbing harness that you could sleep in and get a good night’s sleep. It’s very comfortable even if it isn’t the greatest looking harness out there. But here’s the flaw. The harness is designed for women climbers. If you’re a smaller guy you can probably get away with using it and it’s not terribly feminine looking – it just doesn’t come in large sizes. In fact, it is only available from x-small to medium size. Safety wise the Mammut Lotus doesn’t falter at all. It’s made from very strong materials and includes a few features that really make you wonder why all harness manufacturers don’t include like a tie-in rope protector. All in all if you’re a smaller framed male or a female, this is a very attractive harness for you. When considering which harness would win our ‘Best of Test’, it didn’t take long to decide on a winner. The Black Diamond Momentum AL, for the price and functionality gets our stamp of approval. While we’d all love to own a harness like the Arcteryx R300, in reality, asking climbers to shell out $130 might be a bit much, especially considering that you don’t get THAT much more for your money. If you’re looking for a slightly more featured model, look into the Black Diamond Momentum SA, the AL’s big brother. This entry was posted in Harnesses, Land Sports, Reviews, Rock Climbing, Rock Climbing and tagged climbing harness, climbing harness reviews, harness, harness reviews. Bookmark the permalink.